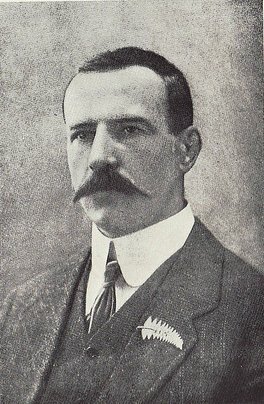 David Gallaher from Donegal became a legendary sporting figure, who overcame curvature of the spine to become a leading figure in New Zealand and world rugby, widely credited with the establishment of the New Zealand team as the world’s best. He was also a soldier who saw action in the Boer War of 1899-1902, and the First World War, in which he was killed. Gallaher (generally known as Dave), was born at Ramelton, son of James Gallagher (sic), a shopkeeper, and Maria McCloskie, a teacher. In March 1878 the family emigrated to New Zealand to settle at Katikati, North Island, in Ulster-born George Vesey Stewart's Special Settlement; they were among the second group to make this move. Vesey Stewart had purchased several thousand acres of land for farming from the New Zealand government, and though the settlement eventually flourished, at first it struggled; Mrs Gallaher had to keep working as a teacher to prop up the family finances. Gallaher was successfully treated for his spinal condition and took up sports, mainly cricket but principally rugby, playing for the Ponsonby club in Auckland. He had many strengths, being not just an exceptional player, but also a clever tactician and possessed of fine leadership qualities. After only one season he was selected for the Auckland provincial team in 1896. His enthusiasm as well as his abilities made him a keen promoter and ambassador of the game. He would eventually represent Auckland province 26 times. The All Blacks played 35 matches against provincial sides as well five full internationals, and lost only one match with a points tally of an astonishing 868-47. The defeat was a narrow one, three-nil against the traditionally strong national team of Wales, marked by a controversial decision not award a try. Even in their first match, against Devon, they won 55-4, a result which so astounded the hosts that some newspapers reported the win for Devon. In over half their matches, the opposition was not able to score any points at all. On their way back to New Zealand they played two matches in British Columbia, winning both easily. Their almost total dominance may were have been especially gratifying as the previous year, the English captain had rather airily predicted that his side would win against these unknowns. Gallaher’s playing days petered out in the mid-1900s, but he remained as selector-coach; he also retained his day job (the game was thoroughly an amateur one at that time) with the Auckland Farmers' Freezing Company, where he became a foreman. He married Ellen Ivy May Francis, the sister of a fellow All Black, at Auckland on 10 October 1906. Their one daughter was born in 1908; she remembered her father as "a jolly man".